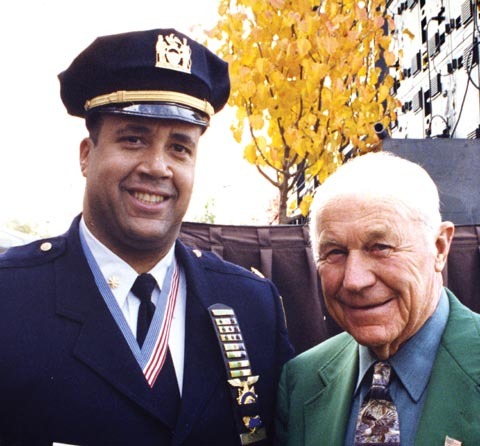 Steve Bonano, who rose up through the ranks of the NYPD to become a Deputy Chief, has died after a two-year battle with a rare, lethal cancer that doctors say was a direct result of his work at Ground Zero in the weeks and months after the attacks of September 11, 2001. He was 53 years old. Steve was near and dear to many of us here at APB, and he will be missed greatly. We honor him here the best way we know how: by sharing his story and saluting his unwavering dedication to serve and protect. Who wore at their hearts the fire’s center. And left the vivid air signed with their honor. Ed. Note: In 2009 Steve took a leave from the NYPD to pursue a master’s degree in Public Administration at Harvard University’s Kennedy School. When he was unable to attend a class reunion his fellow students made this video for him. Steve Bonano’s career is filled with so many accomplishments that it is a bit of a surprise when he talks about what he still feels is the most memorable moment in his career. 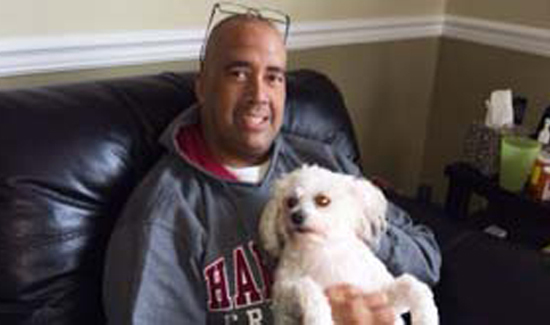 “A call came in for shots fired with the possibility of multiple victims,” Steve remembered. He had just turned twenty-one and had only been on the job for a year. One night Steve was working with Dave Erosa, his best friend since kindergarten, at the Holy Cross Grammar School in the Bronx. It was a Wednesday evening, and they were working the four to midnight shift in the 46th Precinct. They had just gone out on patrol when they saw a car ahead of them go through a stop sign. The officers pulled the vehicle over and kept their hands over their holsters as they approached. “I went to talk to the driver in the front seat, and Dave opened the back door of the car on the passenger’s side,” Steve remembered. “Within seconds, Dave and the guy in the back seat were fighting. Dave yelled, ‘He has a gun.’” A simple stop for not heeding a stop sign had escalated. A lot of people would be surprised that Steve, a tough street cop, was a passionate lover of animals. Along with his fiancé, Miriam, he was totally devoted to his three bichon frises, which many people say are the three most spoiled dogs on the planet. He’s pictured here with one of them, Snowball. One night when Steve was on patrol with Tommy Crowe, they heard a barrage of gunfire. They headed in the direction of the shots. Tommy was driving. He made a left turn, and both officers saw a man standing on the corner, randomly shooting a firearm. When someone who’s had little or no contact with criminals witnesses a police officer acting aggressively toward someone on the street, they often get the impression that cops are violent people who enjoy preying on victims. But the reality is just the opposite. Bystanders at the scene, unaware the man was armed, must have wondered why it was necessary for a police officer to tackle someone who was so badly wounded. As Steve was reporting the incident over his radio, several people ran up and pointed to a Jeep that was stuck in traffic. “The people in that Jeep shot this guy,” they said, pointing to the man who was still lying in the street in a rapidly growing pool of blood. If they were right, Steve knew the people inside the Jeep would be heavily armed. Zallo and his partner stayed with the handcuffed suspect while Tommy and Steve ran toward the Jeep. Three men were inside. The cops ordered them out of the car and told them to keep their hands high in the air. When they searched the vehicle, they found two machine guns, an AR-15, and a semiautomatic handgun. These were heavily armed criminal suspects even by New York City standards. They were only two-and-a-half hours into their shift, and they had four suspects, two machine guns, and a semiautomatic. “One time a cop in a neighboring precinct was shot,” Tommy said. “They rushed him to the hospital, and Steve and I were the first people there. Most people would be surprised at the chaos that goes on at a hospital when the doctors are operating on a high-profile shooting victim. Reporters and photographers are everywhere. They’ll barge right into the operating room if they can in order to get their story. When Inspector Louis Anemone showed up and saw Steve, he asked him to take control of the scene. 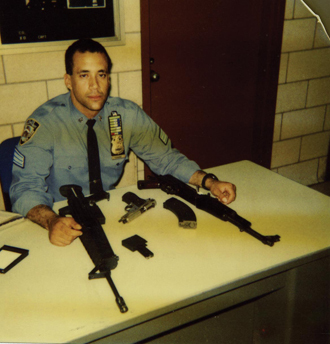 In the late ’80s, Steve was playfully referred to as “The Gun Man” by his fellow officers. One night Steve was working with Jimmy Gildae, a newly promoted sergeant who had just been assigned to the precinct. Like Steve, Jimmy had been very active in the 4-6, and the men shared a strong work ethic. Steve said Jimmy was a cop who was first on the scene and first through the door. “He was the guy you could count on to watch your back,” he said. It was the start of their shift. Steve and Jimmy were sitting in the car, sipping coffees, and watching the street when they heard shots. Seconds later a limousine with shaded windows drove by. “We knew right away there was something wrong with that limo,” Steve said. This time they were lucky. The suspects, young kids in their early twenties, followed orders. They got out of the car with their hands in the air. Once they were cuffed, Steve watched the suspects while Jimmy used his flashlight to search the vehicle. That’s when they found the guns—an Uzi machine gun, a Tech-9, and a semiautomatic. The Quota Sergeant? No way! The dictionary defines a “glass ceiling” as an unacknowledged discriminatory barrier that prevents minorities and women from rising to positions of power. While Steve readily acknowledges there has never been a door yet that shut on him because he’s Hispanic, he has not been immune from wisecracks about his ethnic background. “To some guys, I know I’ll always be the ‘quota sergeant’ even though affirmative action had nothing to do with my promotions. It doesn’t matter how well I do. 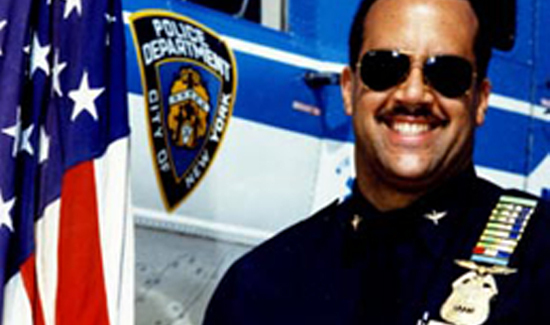 A few people will always believe I moved ahead because the NYPD was being forced to promote minorities. If there is a glass ceiling in the NYPD, Bonano rocketed right up through it. He scored high on the sergeant’s and lieutenant’s tests. Several years later he decided to take on the captain’s exam, a test considered by many as being more difficult than the New York State bar exam. Steve took six weeks off to study, and he worked at it twelve hours every day. When the marks got posted, he was crushed: He’d barely passed. Even after taking a one-year leave to earn a master’s degree at Harvard University in 2009, he still says the captain’s exam was the most challenging test he ever took. After two years in the 4-2 Precinct, followed by another two in the 4-6, Steve went to the Vice Unit in 1986. Working as an undercover investigator, he spent almost four years investigating prostitutes, people running illegal gambling operations, and employees of social clubs, after-hours bars with no operating licenses and a lot of crime. Steve is still amazed that his friends outside law enforcement were envious about the fun they imagined he was having on the prostitution detail. Back on the street, his relief soon gave way to frustration. The way Steve saw it, he had a job to do, and he had been interrupted. He returned to his lieutenant at a predetermined location and told him what happened. Steve gave the lieutenant his gun and told him he was going back inside. The lieutenant looked stunned as Steve walked back toward the club. They let him in. After sitting at the bar for two hours posing as a regular patron, Bonano established a rapport. From that night on, he was able to come and go when he pleased. Eventually he witnessed enough criminal activity to get a search warrant. When Vice detectives and uniformed cops from the precinct raided the club, Bonano was handcuffed and removed from the scene along with the other patrons and employees. The arresting officers read them their rights and put them under arrest, and the club was closed. From Vice, Steve Bonano was transferred to the 52nd Precinct. From there it was on to the Aviation Unit. Not many people knew he had been flying since his dad took him up in an airplane for a surprise ride on his tenth birthday. He’d had a passion for it ever since. 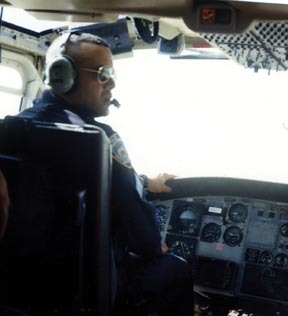 Soon after he was promoted to sergeant, a memo went out that the Department was looking for pilots. Steve decided to do everything he could to become a pilot for the New York City Police Department. Steve and Brigadier General Chuck Yaeger, the first pilot to fly faster than the speed of sound. In New York City, where most of the cityscape is dense and decidedly vertical, helicopters don’t play as significant a role as they do, say, in Southern California, with its endless freeways and one- and two-story structures spread over a vast area. Air support units in the Big Apple can’t follow fleeing suspects like they can in other areas because of the tall buildings and narrow streets. Still, Steve believed helicopters were effective tools in the law enforcement arsenal, and he was determined to achieve his goal. To apply, he found out that he needed a commercial pilot’s license, which required a major investment of time and money. When the flight school told him the cost for the training, he almost gave up. There was no way he had that amount of cash. But when Steve’s father learned his son had put his plans on hold, he made the decision to help him out. Four years into his eight-year stint with Aviation, Steve Bonano made history. He and his copilot, Matt Rowley, had been up for over an hour when the dispatcher’s voice came blaring. A highway unit had attempted to stop a stolen vehicle, and a chase ensued. Steve jumped out, and Matt stayed with the bird. “When I got into the store, I saw the officer chasing the guy through the aisles,” he said. “They were coming right toward me.” Steve ran toward the suspect and tackled him. He pulled the suspect’s arms behind his back, forced his wrists together, and got the handcuffs on. It was only at that moment that it hit him that landing the helicopter might have been a very bad idea. After making sure the officer who began the chase was okay, Steve raced back to the chopper, desperately trying to tuck his shirt back into his trousers as he ran. He was completely out of breath when he got back to the helicopter. Matt was ready to go, and they lifted off. They were feeling pretty good. The cop was okay, and they had nabbed a bad guy. They took a moment to enjoy the calm before the storm. The moment turned out to be a short one. Just a few seconds after they lifted off, a call came in on the radio. “Did you just land a helicopter in a shopping center and engage in a foot pursuit?” the Commanding Officer asked. The commanders who disparaged Steve’s ambition to go to the Aviation Unit realized it didn’t matter where a guy like Steve works or on what assignment. He’s a street cop, whether he’s flying a helicopter or walking a beat. If he sees an officer in need of assistance, that’s it. For Steve Bonano, pursuing a career in law enforcement was a long shot. No one in his family had been a cop, and he had never had much personal exposure to the police. But when he turned fifteen and got a summer job as a lifeguard at a public pool in the Bronx, an older cop, Al Vazquez, took an interest in Steve. Vazquez and another officer, Harry Gonzalez, were both assigned to the pool for the summer. They enjoyed telling the young lifeguard stories about their adventures working as cops. They encouraged him to think about joining the force. 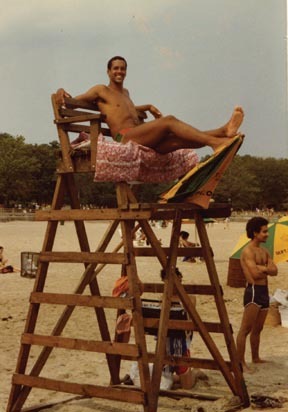 As a teenager, Steve worked as a lifeguard at Orchard Beach in the Bronx. At age 16, he met NYPD veteran cops Al Vazquez and Harry Gonzalez, who patrolled a pool Steve worked at. They encouraged him to join the force. Steve knows that enforcing the laws and protecting innocent people from harm is hard work. A lot of police officers burn out. “I never stop trying to motivate the burned-out cops whose views have become negative,” he says, “but I like to give more attention to the ones who are still into the job. I like to focus on those who, with a little encouragement, will get out there and try their best to be great law enforcement officers despite the enormous frustrations of the job. People who go into law enforcement must work hard to overcome burnout. The signs are unmistakable. Everyone and everything becomes aggravating. Negativity and cynicism seem to overwhelm everything. The tendency to isolate oneself from friends and neighbors who are not in law enforcement accelerates. With burnout, the jokes that have always been the police officer’s best defense mechanism against the constant exposure to rage, violence, and man’s inhumanity to man don’t seem funny anymore. In Steve’s case, after close to three decades on the job, he is relieved that his sense of humor is still intact. Humor is a double-edged sword for law enforcement. The sick jokes, pranks, and endless hazing that go on between cops are their best defense against the brutal world they are thrust into. It is part of life in every police station in the United States. Law enforcement officers try to keep laughing so they can tolerate the horror they witness, from abused children to car wrecks and all manner of violence and death. 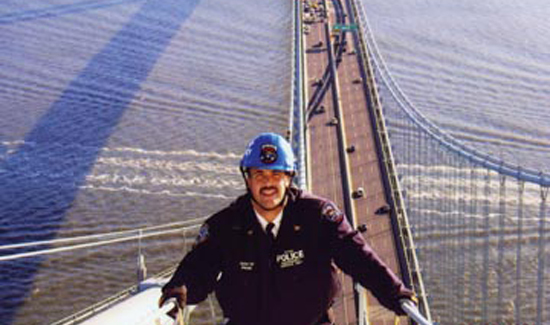 Inspector Steve Bonano on top of the Verrazano Narrows Bridge, 2004. 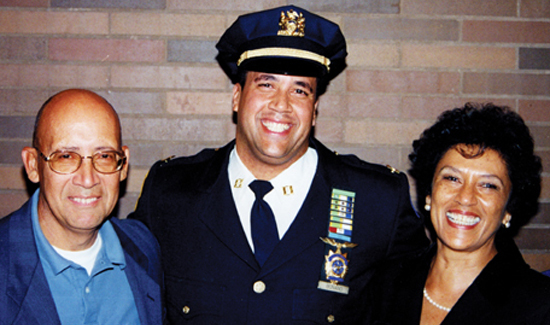 When this photo was taken, Steve was commander of the NYPD’s Emergency Service Unit. But what most police officers find hilarious, civilians find strange. While their jokes help officers stay sane, they are also a wedge between cops and the rest of the world, which has trouble understanding how normal people can joke about events that are tragic. And now Steve Bonano—this remarkable man who did so much good work for his Department and the people of the City of New York—has gone to a better place. But rest assured, his profound impact on everyone who had the fortune of working with him or knowing him, will continue on forever. You can read more about Steve in the book Brave Hearts: Extraordinary Stories of Price, Pain and Courage, available at Barnes and Noble, Amazon, and at www.braveheartsbook.com. A great guy to work with and for. A true gentleman. RIP Chief, Steve. I truly wish that I had had the opportunity to work for this heroic man. This is whom schools should be named after. RIP. Worked with Steve when he came to ESU. A True Gentleman, a Great Cop and Friend. 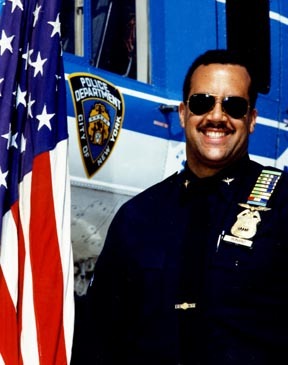 As a Puertorican-American, Retired NYPD Sgt., I was touched as I read this wonderful story of Chief Steve Bonano. May God have him in His Precious Presence. Rest In Peace, BOSS. They don’t come any better! This is a phenomenal story about a phenomenal human being. I remember Steve very well, since he attended Holy Cross with my brothers. I have to smile when I think of him and all the boys that my brothers grew up with. Steve was a great kid who grew up to be a great man, and he did himself and his family proud. Even though we lost touch with him and his family, I am glad to know that he was so highly regarded and made such a tremendous contribution during his all too brief time with us on Earth. RIP, Steve. We will all miss you! 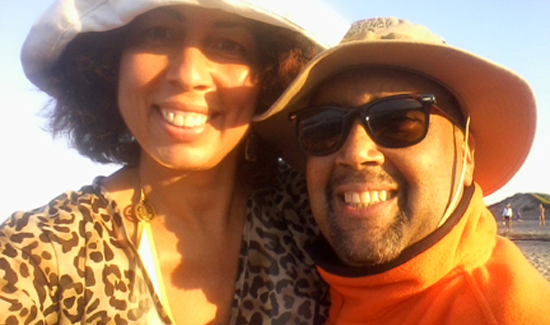 I met Steve at Fraternal Organization events, as I was on the board for the Columbia Association and when he was in Aviation. When the Department started “Taking Your Daughters To Work” days, he was gracious in making sure our command, the 90th got a helicopter to our day. The little I knew him, left a big impact on my memory of him and the pride he had as a fellow cop. My prayers go out to his family and fiance. I worked in the 52Pct. when Steve was assigned there as a sergeant. He was a great boss but an even better street cop. 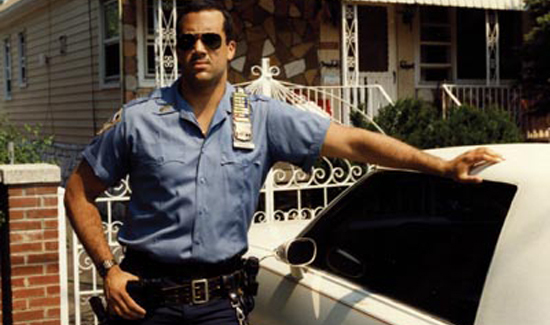 You couldn’t ask for a better cop to have out there with you during the 1980’s hey day of the Bronx. May God grant him eternal rest and believe me there is no one sneaking through the gates of heaven that doesn’t belong with Steve up there!